Scent has an incredible way of evoking memory and emotion. Whether that's the scent of your grandma’s chocolate chip cookies, a fresh cut lawn, or your grandfathers cologne… Certain scents carry certain levels of meaning. The way another person smells can be attractive or off-putting. Smell is a powerful sense and it’s not just limited to the physical realm. Clairalience, or clear smelling, occurs to both psychic and non-psychic people. It’s not something that you can consciously initiate. Instead, it’s something that most often occurs as a sign or guidance from your spirit team. It’s a wonderful gift to receive and to develop. Those with a developed sense of clairalience smell things that are too subtle for others. And, more often than not, these particular smells contain messages or other divine information. How does what you smell affect your mood? Have you noticed that some smells are pleasant to you but not others (and vice versa)? Spend time learning that certain scents have certain meanings for you. Begin to track your mood before, during, and after you experience certain smells. Some repetitive smells can be reminders to relax, to walk away, or to engage if you’re uncertain. When my grandmother was alive, she wore a specific brand of face powder with a distinct scent. After her death, I began to smell this scent at times when she would reach out from beyond the veil. When you catch the signature scent of your loved one in spirit or a scent that simply reminds you of time you spent with that person, it could be a sign that his or her spirit is near. This could be cologne or perfume, smoke (if they were a smoker), or even the smell of cookies, or freshly baked bread if they loved to bake. When you experience the signature scent of a loved one in Spirit, this is often a sign their spirit is with you, wanting you to know they’re near. Even if you find yourself smelling scents that remind you of people you had a difficult past with, it could be their spirit attempting to make things rights by causing you to remember and process your feelings. When you suspect that this is happening, try to take a moment to acknowledge that you sense his or her spirit. Try talking to them or recalling memories that you have of them. The smell may be brief or long-lasting – either way, try to see it as the gift that it is. Your angels will also send messages via clairalience. 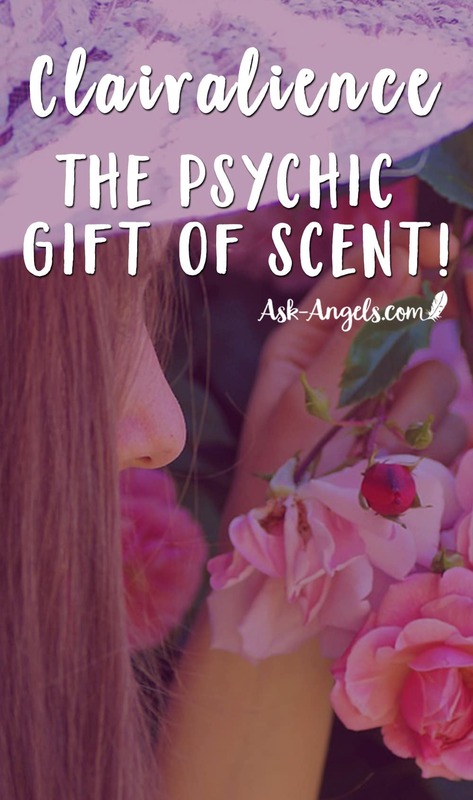 If this is a particularly strong psychic gift for you, an angel who is particularly connected to you may project a smell when they are near. To me, angels have a subtly sweet floral scent. When you notice a pleasant smell that has no physical counterpart, this is a clear indication of the presence of a higher dimensional spiritual being. Taking note of all the smells you encounter during a day is important. Training yourself to be sensitive to the power of smell can improve your life in both this realm and the psychic. 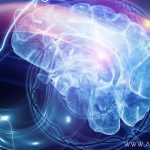 Recalling difficult to access memories – a smell can bring back a person or situation that you’d forgotten about on a conscious level. It’s a simple as smelling your mothers perfume on another and then feeling your mothers presence, to something as complex as a smell reminding you of an obscure childhood memory that you perhaps repressed. Being able to read other people – it’s possible for a smell to evoke a psychic impression in order to get a ‘read’ on someone. Smells that are may be so subtle yet can tell you if a person is attracted to you or not, or if someone is very ill. It’s also possible to smell if someone is uncomfortable, annoyed, lying, or scared. Meditating and relaxing – there is a reason why body work healers use scents during their treatments. Soothing smells can bring on deep relaxation, ease muscle tension, and alleviate stress. Some smells will also help you enter a deeper meditative state and open you up to further psychic impressions. Sensing Energy – Sometimes you may find yourself in someone’s house, office, or other space and realize that you don’t feel comfortable but aren’t really sure why. When that happens, tune in to your sense of smell. This psychic sense will provide you with a lot of information about the space you are in. Sensing danger – On a physical level, you can smell rotten food and not eat it, or you can smell gas and know there is a leak. On a psychic level it is possible to smell danger. You may not be able to verbally define it in the moment, but clairalience is telling you that something isn’t right. Sensing spirits – This often requires a more attuned psychic ability, but as mediums will tell you, sometimes the first indication that you are in the presence of a spirit is the trace of a scent that is connected to the spirit. Everyone emits a natural scent that is in line with their energetic vibration. Even those who are not clairalient can pick up on this smell and intuit things about you. Those who are heavily clairalient can tell if you are sick, attracted to another, being dishonest, and more. You can learn to impact people’s mood by matching your natural scent to particular personality characteristics. If you are calm and open, people can, over time, simply associate your psychic order with calmness and openness. It’s an incredible gift that can help change the mood of a person or a group if they are needing comfort or support. By developing your clairalience, you can use the sense of smell to get intuitive insights from your angels and spirit guides. Remember that they are always looking for creative ways to connect with us and they will use the means that is best for you. Developing a psychic skill like clairalience will increase your ability to be guided. Clairalience can also help you to be more aware of your own psychic smell. Whether your natural psychic smell is what’s needed or you feel that a certain situation or environment needs a particular smell, you can have more control over situations and the people near you. If you suspect you have this gift, spend time focused on it. The more you pay attention to the smells around you, the stronger this psychic gift will become. You can eventually learn to use it in tandem with your other gifts. By accepting the information and messages that are being sent to you and taking action, all your psychic gifts will natural strengthen. Learn more about how to develop all your psychic abilities here!